I went to a supermarket in my locality here. I always pay bill using credit card and so I kept my credit card in my purse. I purchased all the grocery and household essentials for me. Finally the bill was made in the super market. At that time, I opened my purse and I was shocked that I did not find my credit card in the purse. Luckily, I had some money in my purse so that I was able to pay my bill in the super market. In the same day, immediately after reaching my home, I went to bank (SBI where I keep the account) and informed the incident to the bank manager. He asked me to write a letter and submit so that the new credit card will be given to you. I have written the request to block / stop immediately the credit card transaction and give me a new card. 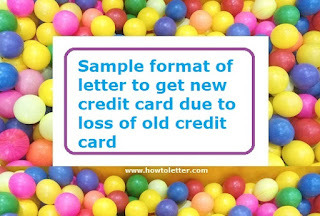 Here is the letter format I used. You can use this format for your need if you are required to write a letter like this one for getting new credit card due a loss or theft of your old credit card. I am one of the customers of SBI here. Today (06th Sept 2018) I have lost my credit card. Hence I request you to block my credit card associated with my current account _______________ [Write account number here] for the security purpose. Also I request you to please issue me new credit card as soon as possible. Thank you! I used the above letter format and requested to block and reissue new credit card. The bank accepted my request and blocked my credit card that was lost. And finally given me a new credit card within 3 days. You may use the above format for your purpose if you have across such situation.